Even though a TV production schedule may be lightning fast, show writers, directors and visual artists take the time to pay attention to the details. So when the chance to slip in a hidden reference presents itself, they take it. Casual viewers may not catch the references hidden in a TV show, but die-hard fans will be rewarded with a nod to another one of their favorite shows beloved by the writers - or the punchline to a long-running joke. Here are Screenrant's 10 Hidden References in Amazing TV Shows. In one of the lighter scenes from The Walking Dead's first season, Glen drives a red Dodge Challenger out of Atlanta, blasting music and the car’s alarm to draw walkers away from the other members of his group. A red Dodge Challenger also appears on another AMC series, Breaking Bad. Walter White buys the car for his son, and the general manager of the dealership just so happens to be a man named Glen. The appearance of the car is just one of tons of easter eggs that have led some fans to believe the two shows exist in the same universe. From its very first episode, The CW’s Flash was jampacked with easter eggs and nods to the speedster's comic book history, but the show also tipped its hat directly to the writers who had made the biggest impact on the character. Writer Mark Waid, illustrator Scott Kolins and artist Howard Porter all contributed memorable work to The Flash comics, included as street addresses in the show’s universe. But none of that compares to Professor Stein's “Conway Prize for Scientific Advancement” – named for famous Marvel and DC writer Gerry Conway, the creator of Stein’s alter-ego, Firestorm. FOX's sci-fi series Fringe followed a team of FBI agents who use fringe science to investigate unexplained events, all under the watchful eye of a mysterious bald stranger called The Observer. The Observer appears in every episode of Fringe, but leading up to the show's second season, this mysterious man appeared on other Fox broadcasts. He could be seen in the audience on American Idol, on the sidelines of a football game and a NASCAR race, as well as in the crowd at a Major League Baseball game. Easter eggs in one show are impressive, but across a network is something even rarer. Before The Walking Dead was a hit TV show, it was a hit comic series by Robert Kirkman. It wasn’t Kirkman’s only comic, either. References to the creator’s other comics are littered throughout the show's five seasons. Carl's shirt from season 1 features the logo of "Science Dog," another Kirkman comic. And in season 5, copies of "The Astounding Wolf Man" and "Invincible" make appearances on screen being read by Carl and Enid. Community - "Beetlejuice, Beetlejuice, Beetlejuice"
Tim Burton's 1988 comedy/horror film Beetlejuice stars a freelance bio-exorcist who helps ghouls scare away the humans who move into their homes. If you need his services, Beetlejuice can be summoned by simply saying his name three times. 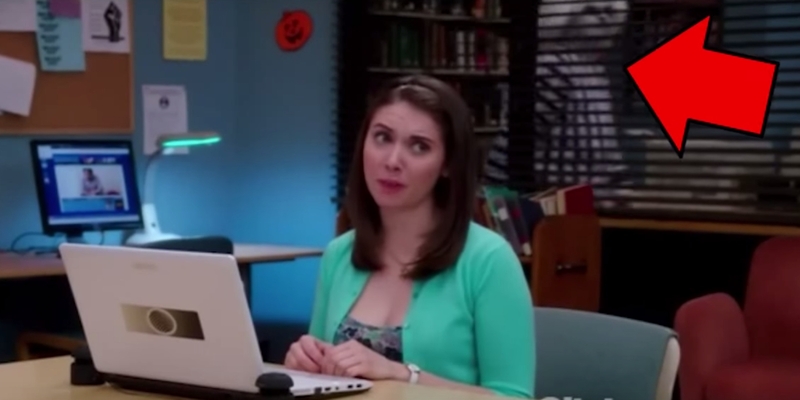 Community set up a three-season long gag based on that idea. After working Beetlejuice's name into scripts in seasons 1 and 2, the ghoulish character appears in the third season when Annie finally speaks his name for the third and final time. The CW's Arrow follows the vigilante Oliver Queen, heir to mega-corporation Queen Consolidated. Fellow DC Comics TV show Gotham takes place in an alternate universe, but the two crossed paths when a Queen Consolidated Logo appeared in the skyline of Gotham's famous city. However, Gotham producer Danny Cannon denied this was an indication of a crossover between the two series, claiming the logo's inclusion was unintentional. Following the success of the AMC series, Telltale Games developed an episodic adventure series based in the zombie infested world. Instead of following Rick Grimes, the game focuses on characters Lee Everett and Clementine in the Georgia town of Macon. The game received critical acclaim, and even earned its own reference in the TV show. In the season 4 premiere, Michonne points out the county of Macon on a map - an easily missed nod to the video game. Battlestar Galactica - Serenity Lives! The short-lived space-western Firefly has earned a massive die-hard fan base who helped the show to live on in the feature film Serenity, named after the spaceship piloted in the series. Shortly after Firefly ended, the Battlestar Galactica miniseries premiered – one more cult sci-fi series with a dedicated following. The premiere paid homage to its colleague, including a brief shot of Serenity in the show’s background. The shot was included by visual effects artists Jarrod Davis and Lee Stringer, who both worked on Firefly as well as the big screen adaptation. For a few years, NBC's Thursday night comedy block was a heavy hitter, including 30 Rock, Community and Parks and Recreation. When Troy is reacting to meeting his childhood idol in season 2, a poster on the wall features a stock photo of another NBC comedy star. The candy striper on the poster is none other than Parks and Rec's Amy Poehler, who was in her 20s when she posed for the photos, well before she played Leslie Knope. The political drama The West Wing offered audiences a look inside the workings of Washington’s White House, and apparently earned plenty of fans in the art department on Star Trek: Voyager. 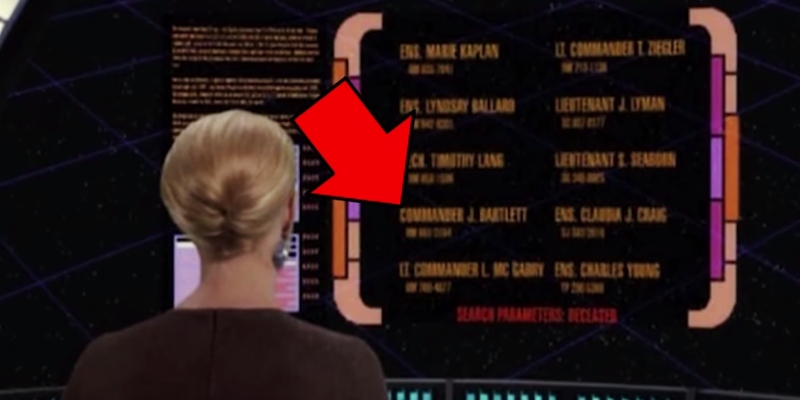 So when a season 7 episode saw Seven of Nine pull up a list of crew members killed in action on the starship Voyager, names like Commander J. Bartlett were obvious references to West Wing cast members, like Martin Sheen’s President Jed Bartlett. Star Trek graphic art supervisor Mike Okuda confirmed the nod to the political drama, and that he wasn’t the only staffer looking to give the TV show a nod. So what do you think of our list? Did we miss any of your favorite references or easter eggs? Let us know in our comment section and don't forget to subscribe to our channel for more videos like this one.